Married couples use a variety of tools to manage their schedules and stay connected. Today’s married couples use a variety of tools—landline phones, cell phones, instant messaging, and email—to manage their schedules and stay connected with each other throughout the day. The adoption of cell phones is a particularly important component of the way today’s families stay in touch and coordinate their lives together. Couples communicate frequently just to say hello and chat (28% of couples do this several times a day, and an additional 36% do so at least once a day) and also to coordinate daily schedules (20% do this several times a day, and 39% do so at least once a day). However, many also communicate regularly for weightier reasons: discussing important matters and planning future events. Given the time and scheduling demands of raising a child, it is not surprising that parents communicate more frequently throughout the day than non-parents. Three-quarters of parents (74%) contact their spouse or partner once a day or more to say hello and chat (compared with 58% of non-parents), 70% do so to coordinate daily schedules (compared with 51% of non-parents) and 42% do so to discuss important matters (compared with 34% of non-parents). Parents (20%) and non-parents (17%) are equally likely to contact their spouse daily to plan future events with friends and relatives. The telephone – and the cell phone in particular – is the tool of choice for communication between spouses. Couples use the internet and cell phones to facilitate the personal interactions and routines of daily life. 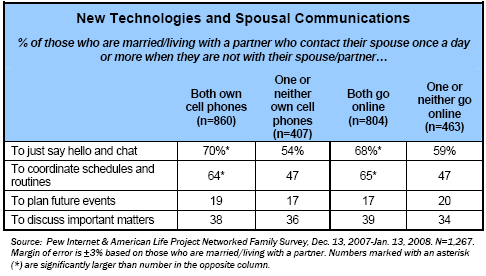 Married couples use a wide range of technologies to communicate. Most of all, the telephone—especially the cell phone—is the tool of choice for couples to keep connected. One in five married adults (21%) say they contact their spouse several times a day using a cell phone, and an additional 26% do so at least once a day. 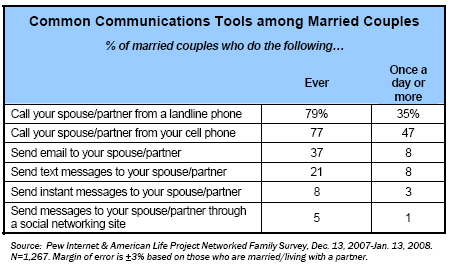 In other words, 47% of married adults contact their spouse daily by cell phone, as compared with 35% who communicate daily by landline telephone. Married couples use new communication technologies such as the internet and cell phones primarily to facilitate scheduling and to simply stay connected throughout the day. Compared with less tech-heavy couples, couples in which both spouses go online or own cell phones are significantly more likely to contact each other daily to say hello and chat, as well as to coordinate schedules and routines. However, new communication technologies do not seem to play an especially important role in planning future events or discussing important matters. Couples using cell phones or the internet are no more likely to discuss these matters daily than those who do not use these technologies. These discussions are most likely taking place in-person or using traditional landline phones. While married couples rely heavily on cell phones to stay in touch, they are much more likely to communicate by voice calls than by text messaging. Although nearly half of married adults call their spouse once a day or more on a cell phone, just 8% send text messages to their spouse with a similar frequency. This preference for voice communication is not simply a matter of technology adoption. Even for those married adults who own a cell phone and use text messaging, 78% call their spouse on a cell phone at least once a day while just 22% send daily text messages to their spouse. Compared with voice communication using cell and landline phones, internet communication tools such as email, instant messaging and messages through social networking sites make up a relatively small component of how couples communicate. Fewer than one in ten couples (8%) send daily email to each other, just 3% send instant messages daily, and just 1% communicate daily by sending messages on social networking sites such as Facebook or MySpace. Parents rely on the telephone to keep in touch with children as well as spouses. In addition to staying connected with one another throughout the day, couples also use communication technologies to stay connected with their children. As with adult-to-adult communications, cell phones and landline telephones are the primary technologies parents use to keep in touch with their children over the course of the day. 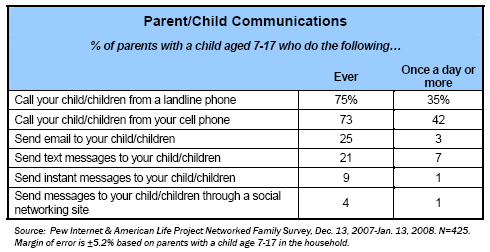 Two in five parents (42%) with a child aged 7-17 call their child from a cell phone once a day or more, and 35% do so from a landline telephone. By contrast, only 7% send daily text messages to their child, and just 1% send instant messages or messages on social networking sites on a daily basis. Most women and men share the job of staying in touch with friends and family, but in some families women are still the primary kin-keepers. Past research has indicated that women often take a leading role in managing household communications, using the internet and other communications technologies to reinforce existing personal relationships and to cultivate relationships with their family and friends (Wellman 1985). Our survey finds some evidence of this: Women are primarily responsible for staying in touch with friends and family in 28% of married households, while men are the primary connector in just 4% of cases. However, we find an even greater amount of egalitarianism in the way couples communicate. In the remaining two-thirds of married households, the job of staying in touch with friends and family is divided equally—46% of married couples keep in touch jointly with friends and family, while 22% assign some contacts to one partner and some to another. As with communication with friends and family, married couples generally share the job of communicating with children—among married parents with children under 18 years old, 57% share the job of communicating with their child or children equally between spouses. In the remaining married households, women tend to play a leading role in child communication: 36% say that the wife is the primary child communicator and just 6% say that the husband is the primary person responsible for communicating with the child/children. With respect to their use of different communications technologies, women are more likely than men to contact their child or children daily using a landline phone or cell phone text messages.